The Baseball Scorebooks are extremely helpful for coaches, team managers, and even for parents. They’re cheap and doesn’t cost much. But, still, you do not want to spend even a few dollars on the wrong product. 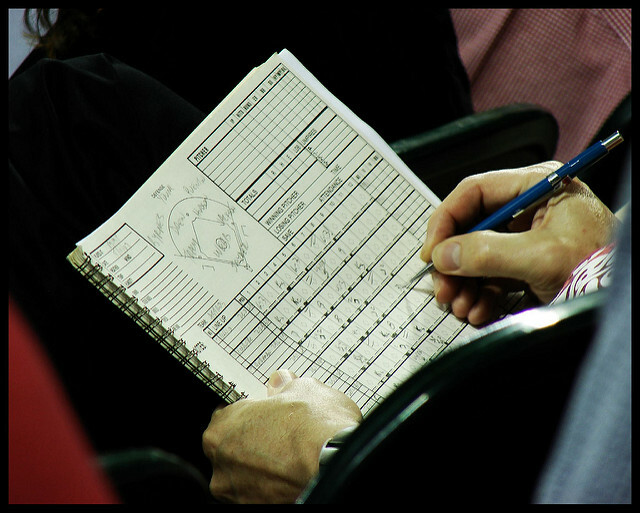 Here, you’ll find out how to find the best scorebook for scorekeeping in a baseball game. In the next section, you’ll see my personal recommendation to the baseball lovers for scorekeeping. Who Should Buy Baseball Scorebook? Can It Be Used for Both Baseball & Softball? When it comes to baseball scorebook, my personal recommendation is BSN Baseball/Softball Scorebook. It is one of the cheapest scorebooks available on the market. The price is very low, but still, I’m really impressed by the quality of the whole scorebook. In one book, you can score 26 games, that includes 16 batting positions and 9 innings per sheet. I really liked the printing quality and the overall page thickness. While using it, you’ll not feel like it costs just a few dollars. If you want a scorebook for little league or for high school baseball, then I have to say BSN Baseball/Softball Scorebook is good and it’s enough for such leagues. However, if you want a scorebook for MLB, then you should go with Oversized Version of BSN Baseball/Softball Scorebook. Nowadays, high technological scoreboards in professional games have taken the place of the traditional scorekeeping on paper and pencil. If you are a fan of this traditional method of scorekeeping and want to learn it, maybe just for fun and your own satisfaction or to be an official scorekeeper of your team, buying a baseball scorebook is a must for you. Official scorers of local school matches or any teams can buy scorebooks to keep records of every match in a single book instead of loose score papers. 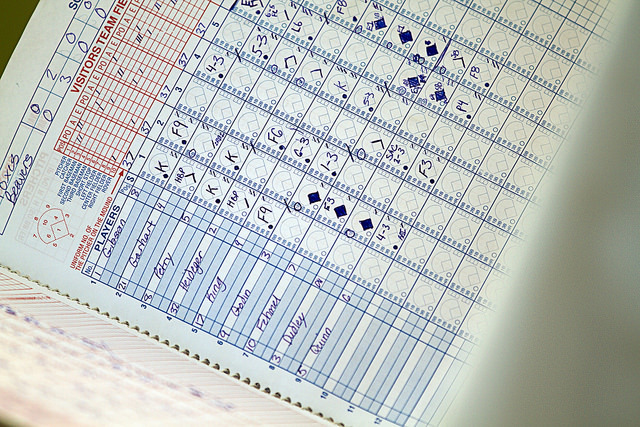 It is important to consider and examine the quality and specifications of a scorekeeping book before buying it. A good scorebook is bound to have great quality and bleed-proof papers with good binding to hold those scoresheets together. Look for the features which will enable it to go through the wears and tears of the game, with effective durability and a user-friendly layout. A proficient and resilient design with durable covers and binding will help you score the game more efficiently and easily without having to think about damaging the book. Smaller books have limited space for additional notes and you might need to be creative or add sticky notes to record extra information. The dimension of the book and the pages inside depends on what book you buy according to the number of game sit can fit. Scorebooks for games of high school or Little Leagues have smaller pages for less amount of pitchers while more professional games have much more details in the scorecards hence bigger pages. Also, if you want to score both the teams in one single page without having to flip back and forth for a game, the dimensions are usually substantial than the normal size. Look for scorebooks that contains all the features in a considerably sized scorebook which is easier to carry around and suitable for all kinds of baseball games. If you are buying it in a store, make sure to flip through the pages inside and examine the printing of the scorecard. Avoid books with pages which have dull prints or misprints as they will create a problem. While you will be in a hurry to score the game as it advances, most of the time you would not even understand what is printed on the paper. Make sure to buy scorebooks from a brand with ample reviews to ensure the quality of the product if you are buying online. Scorebooks which have a hardback cover are easier to work with during a baseball game. Hardback cover ensures durability and provides protection. They also serve as a makeshift clipboard and ensures stable writing. With a flexible cover, it is harder to write in the scorebook and is also hard to handle. A hard back cover makes it easier to write on it if you do not have access to a table or a solid surface during the game, which you usually do not. It is essential to choose a baseball scorebook with a hard back cover to effectively take scores faster and easier. There are plenty of scorebooks that can be used for scorekeeping for both the games, baseball as well as softball. If you need something which can record scores for both baseball and softball, then you can get numerous possible options. Different scorebooks have their variants of the number of scoresheets available. Specific options are available for a specific number of games that they are supposed to record. Scorebooks which have a combination of both the teams on the same page obviously have a lesser amount of pages according to the number of recordable games. You can choose one which can record up to 100 games or you can choose one which can record 20 games. All of it depends on your requirements. Check the features, as in how many sheets will it provide and how many games can it record and thus choose accordingly. 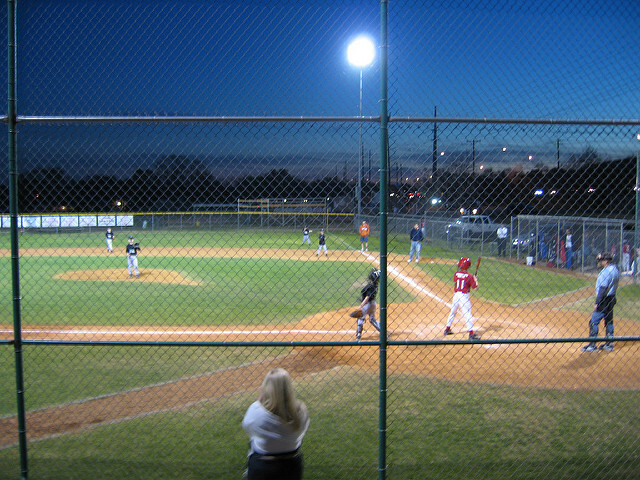 Several scorebooks can be found online or nearby sports stores which have features which suit baseball games of Little Leagues, high school games as well as Major League Baseball. While Major League Baseball scorebooks have a few little additional features for accurate gameplay score recording, there are some which serves purposeful for all aged games. But, make sure you know the basics of score-keeping of a little league match. The price of a baseball scorebook depends on the quality of the book as well as the number of scoresheets that are provided in the book. Generally, scorebooks cost as cheap as 5 dollars or even less than that and have sufficient feature and scorecards for around 20 to 30 games. Scorebooks with better quality and durability as well as with a greater amount of scorecards can cost up to as much as 40 dollars. Find one with adequate features and scoring sheets within your budget. If you are purchasing it for the first time, then make sure to learn how to use it before taking it on the game. BSN Baseball/Softball Scorebook comes with two variants, regular sized and super sized with a slightly higher price. Both, baseball as well as softball can be recorded in it. With simplified scoring instructions, coaches of all skill levels can keep track of the games and the players and progress with ease. Each book can score up to 26 games, with 16 batting position so you can follow all the way from the pre-season to the tournament. It can record up to 9 innings per sheet so each at-bat and home run can be documented by the scorekeeper in one location very conveniently. With easy to use scoring instructions, this enables the coaches to record their baseball or softball players’ performance throughout the entire season. The scorebook also includes a team roster, batting average chart season total, season schedule, and pitcher stats for a more comprehensive examination of the team and monitor their progress throughout the season. The coaches can take much detailed information about how their team and players are playing as well as informed roster decisions for further reference for future games. This also comes with a spiral binding which makes it easier to flip through the 9-1/2″ x 11″ pages. The Rawlings Deluxe System-17 Baseball & Softball Scorebook comes with a very generous size of 11 x 14 inches and provides ample of space for writing. There are 40 pages of scoring, thus a total of twenty games can be scored in this scorebook. The extra space proves to be a significant feature as it gives 17 batting slots with two substitute lines for each. It can record scores of both the games, baseball as well as softball game. In softball games or a rec league where there can be more than 9 or 10 batters and may have a lot of substitutions, the additional space and slots are very beneficial here. With a simple and straightforward and user friendly design and a generous spiral binding, the scorebook is very easy to use for coaches and scorers of all calibers. It has a very strong and hard back cover which ensures stable writing. It also includes the official Quick Tally Pitch Count Log. With its easy to read and a simple system of scoring, it is a great option for beginners. With its comprehensive design and an easy to use the scoring system, C.S. Peterson’s Super 16, Baseball and Softball Cramer Scorebook enables the coaches and score keepers to record a complete summary of individual batting records and pitching performance. This has a durable back cover which ensures more stable writing and also has a wire bound top for easy flipping through the pages. The Cramer Scorebook can record up to twenty five games. It can be used to score both baseball games as well as softball games. This can score only one team per sheet so you have to use two sheets for one game. The scoresheet can record up to 12 innings with additional smaller blocks after it which can be used for statistics and also extra innings if needed. It is an ideal scorebook for scoring Little League or high school games. It can record 11 batting positions and has the measurings of 12″ x 8.5″. With this, you receive the ultimate convenience quality. It has all the prime features that an exceptional scorebook should have. The scorebook allows the score keeper or coaches to record up to 100 total games which means this book is going to last for a very long time. When it comes to the quality of the score book, it has a hard backing and laminated cover with durable plastic coiled banding which are designed to be resilient. The back cover is made up of a very sturdy hardboard base that also functions like a makeshift clipboard which gives you extra writing surface and support. It also ensures to act as a support for the scoresheets for more stable and smooth writing. This scorebook from Covey Sports has a side by side format of each sheet which allows the score keeper to score both the teams of a game in one single page. This makes it easier and more convenient to keep scores without having to flip through the pages back and forth throughout the entire game. The measures of this book are 17 x 11 inches which give you more space to write additional notes and statistics. The scorebook is truly built to last and can be used multiple high school seasons or little league seasons, or for one long long travel ball season. The fully functional scorebooks of Glover’s provide great features. With a size of 10 x 12 inches, it is handy and easy to carry around scorebook. It can record up to 30 games and also bats up to 15 players. With an orange colored poly covering and a crush prevention spiral binding, it is a durable and sturdy scorebook. It also has a set of scoring instructions which are very easy to follow and are ideal for beginners. It also comes with an extra batting average chart and a pitch count to meet the league tracking requirements. It also sports an individual player stats as well as pitching stats to further overall utility. Scorebooks can come in many shapes and sizes packed with various features. Keep all the factors discussed above in mind before buying a scorebook which meets your requirements and suits your scoring style. A good scored game can make us see the whole game by one look at the score sheet. Make sure that you buy a scorebook that lasts longer and is reliable and has space for all the things to be noted down with additional space for extra notes and information.